Virgil Glen Geiger Jr. was born in Mobile, Alabama on August 2, 1949, graduating from Mary G. Montgomery High School and Troy State Universit. He enlisted into the United States Army on May 12, 1975 and began his long and distinguished career. In 1976 he graduated from the United States Army Ranger Course and in 1979 he was assigned to the Mountain Ranger Camp and here is where my story begins. Believe it or not, Virgil was a quiet man, a complicated man with many talents. He presented himself as a true professional, a man who was proud of his accomplishments and a man who learned from his failures. He would do anything for you if you earned it. He was not a giver who just gave, but he was a giver to all who needed it given. The nickname "Billy Jack" was given to Virgil by Frank Kelly and me when we all lived together in a small trailer on Camp Wahsega Road. Why "Billy Jack?" Virgil looked just like the actor Tom Laughlin who directed, starred and co-wrote the movie, The Born Losers. Their personalities, features and movements were exact, to include wearing of the hat. We didn't mess with Virgil when he wore the hat! 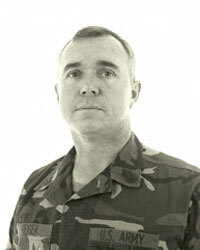 SGM Virgil Geiger, proudly served 23 years in the United States Army, serving from 1975 to 1998. The many awards that he earned in his twenty-three year career included the Legion of Merit, Meritorious Service Medal, Army Commendation Medal (5th Award), Retired Lapel Button, Army Good Conduct Medal (7th Award), National Defense Service Medal, Noncommissioned Officer Professional Development Ribbon with Numeral 4, Overseas Service Ribbon (2nd Award), Master Parachutist Badge, Pathfinder Badge, and the Coveted Ranger Tab. SGM Virgil Glen Geiger Jr. passed away October 25, 2014 at his home in Childersburg, Alabama. He was a born again Christian who believed in the virgin birth of Christ our Savior, his crucifixion, burial, resurrection and ascension. He is survived by his wife, Susan Geiger, two sons from a previous marriage, Major (USAF) Jose Geiger, Jonathan Geiger and three grandchildren. SGM Virgil Glen Geiger was buried with military honors on October 30, 2014 at The Alabama National Cemetery in Montevallo, Alabama.